It all comes down to this! Yesterday’s winner was Kenta Lee, from Dallas, Texas. He’s facing today’s winner, Ben Hernandez, from Palm Springs, CA. 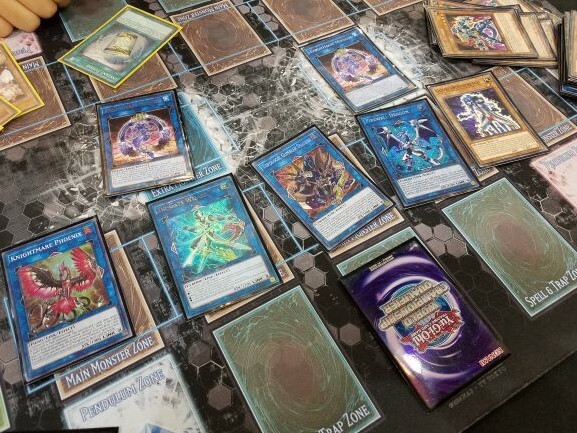 Both Duelists are using Gouki Decks, so this is going to be a Match of who can create the best combo first. 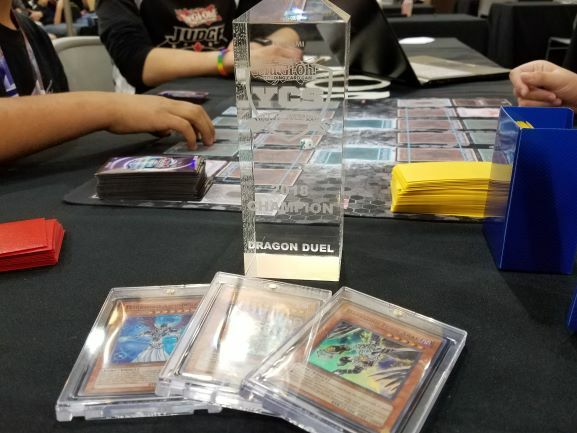 The winner here gets a set of the Darklord prize cards, as well as the all-new YCS Dragon Duel Champion trophy debuting at this event! Hernandez won the dice roll and played first. Hernandez played Neo-Spacian Aqua Dolphin, discarding Destiny HERO – Malicious to look at Lee’s hand! Lee had two Magical Mid-Breaker Field, Knightmare Corruptor Iblee, Junk Forward, Destiny HERO – Malicious. Aqua Dolphin destroyed Iblee. Hernandez used the discarded Malicious to Special Summon another Malicious, and Link Summoned Isolde, Two Tales of the Noble Knights. Isolde added Gouki Bearhug to his hand, then sent Divine Sword – Phoenix Blade to the Graveyard to Special Summon Gouki Octostretch. He Link Summoned Summon Sorceress, and Octostretch added Gouki Suprex to his hand. He Special Summoned his third Malicious, then had Summon Sorceress Special Summon Gouki Twistcobra. He used Malicious and Twistcobra to play Knightmare Phoenix, and Twistcobra added Gouki Re-Match to his hand. He used it to Special Summon Octostretch and Twistcobra. Twistcobra and Summon Sorceress were used to play Firewall Dragon, then he added Phoenix Blade from his Graveyard to his hand. He used Knightmare Phoenix to play Knightmare Mermaid. Mermaid’s effect discarded Phoenix Blade to Special Summon Iblee, and Firewall Special Summoned Suprex. He used Iblee and Suprex to play Binary Sorceress, and handed Iblee to his opponent. Suprex’s effect put Riscorpio in his hand, and Firewall Special Summoned another Suprex. He added Phoenix Blade to his hand. 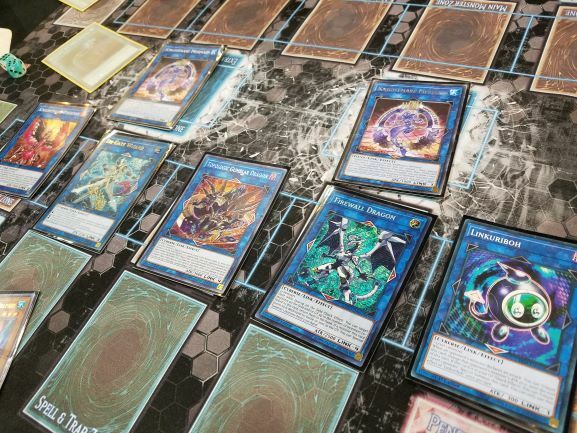 Suprex and Octostretch were used to play Knightmare Cerberus, which discarded Phoenix Blade to destroy Iblee and draw a card. Firewall bounced Suprex and Octostretch to the hand, then Firewall Special Summoned Riscorpio. 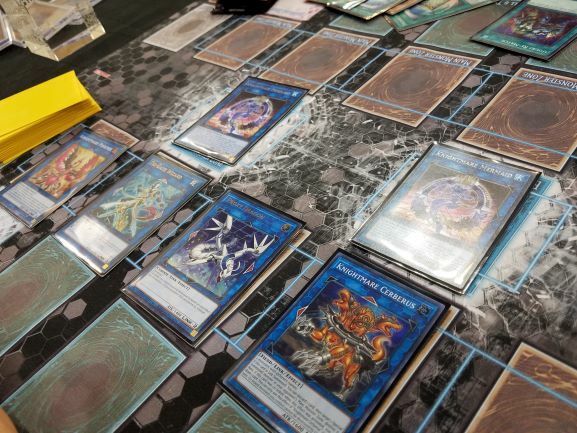 He used Riscorpio and Cerberus to play Tri-Gate Wizard. Riscorpio added Gouki Headbatt to his hand, and Firewall Special Summoned Octostretch. He used that to play Linkuriboh, forming an Extra Link! Firewall Special Summoned Aqua Dolphin, then Hernandez returned Phoenix Blade to the hand again. Aqua Dolphin discarded it to destroy the Junk Forward from Lee’s hand. He used Aqua Dolphin and Linkuriboh to play Knightmare Cerberus, and Firewall Special Summoned Suprex. He then used Cerberus to play another Mermaid as an Extra Link, and Firewall Special Summoned Headbatt. He used Headbatt and Suprex to play Knightmare Phoenix, now leaving Tri-Gate Wizard co-linked with three monsters. Firewall Special Summoned Twistcobra. He used Twistcobra and Binary Sorceress to play Knightmare Unicorn, then Set and activated The Phantom Knights of Shade Brigandine. He returned Phoenix Blade to his hand once more. He used Unicorn and Brigandine to play Topologic Gumblar Dragon! It discarded two copies of Instant Fusion from Hernandez’s hand, discarding Malicious and Magical Mid-Breaker Field from Lee’s hand! Firewall Special Summoned Octostretch to the field. Lee had nothing left but Magical Mid-Breaker Field, and drew Called by the Grave. Hernandez used his Octostretch to bring back Linkuriboh, Lee used Called by the Grave, and it was negated by Tri-Gate Wizard. Lee was completey out of options on his first turn, and conceded the Duel! Lee played first this time, and started with Iblee, Headbatt, Octostretch, Twistcobra, and Suprex. He played Suprex, which Special Summoned Twistcobra. He Link Summoned Isolde, Two Tales of the Noble Knights, using all three effects to add Gouki Re-Match, Riscorpio, and Junk Forward to his hand. Isolde’s second effect sent Phoenix Blade to the Graveyard to Special Summon Octostretch. He discarded his spare Octostretch to Special Summon Headbatt. Headbatt and Isolde were used to play Summon Sorceress, and Headbatt added Bearhug to his hand. Summon Sorceress then Special Summoned Destiny HERO – Malicious, and he used that with Octostretch for Knightmare Phoenix. Octostretch added Suprex to his hand, then he Special Summoned a second Malicious. He used that with Summon Sorceress to play Firewall Dragon. He Special Summoned his third Malicious, then returned Phoenix Blade to his hand. He used Knightmare Phoenix to play Knightmare Mermaid, and Firewall Special Summoned Riscorpio. That with Malicious were used to play Proxy Dragon. Firewall bounced Suprex and Octostretch to his hand, Riscorpio searched Twistcobra, and Firewall Special Summoned it. He played Re-Match and Link Summoned Knightmare Cerberus, and Firewall Special Summoned Suprex. He used those two to play Tri-Gate Wizard, then used Iblee to play Knightmare Mermaid. He played Knightmare Phoenix and Knightmare Cerberus, and Set Phoenix Blade. Hernandez drew his next card, and conceded! He was on the receiving end of an Extra Linked Tri-Gate Wizard, just like he had performed in the first game! It all comes down to this final Duel. Hernandez began the Duel with Neo-Spacian Aqua Dolphin, discarding Suprex. Lee revealed his hand of Ash Blossom & Joyous Spring, Headbatt, Bearhug, Junk Forward, and Instant Fusion. Hernandez destroyed the Ash Blossom, leaving him free to begin his combo! He played The Phantom Knights of Shade Brigandine and Link Summoned Isolde, adding Bearhug to his hand. Then, Isolde sent Phoenix Blade to the Graveyard to Special Summon Octostretch. He Link Summoned Summon Sorceress, and Octostretch added Gouki Re-Match to his hand. He activated it to Special Summon Suprex and Octostretch, then Summon Sorceress Special Summoned Malicious. He used Malicious and Suprex to play Knightmare Phoenix, and Suprex searched out Headbatt. He discarded Bearhug to play Headbatt, using it with Summon Sorceress for Firewall Dragon. Headbatt searched out Riscorpio. He added Phoenix Blade to his hand, then used Knightmare Phoenix to play Knightmare Mermaid. Mermaid discarded Phoenix Blade to Special Summon Iblee, and Firewall Special Summoned Riscorpio. He returned Phoenix Blade to his hand again, then used Iblee and Riscorpio to play Binary Sorceress, and Iblee went to Lee’s side of the field. Riscorpio added Suprex to his hand, and Firewall Special Summoned Twistcobra. He used it with Octostretch to play Knightmare Cerberus. Twistcobra searched out Suprex, Cerberus destroyed Iblee and drew a card by discarding Phoenix Blade, and Firewall bounced Aqua Dolphin, Octostretch, and Riscorpio to Hernandez’s hand. Finally, Firewall Special Summoned Riscorpio. He used Riscorpio with Cerberus to play Tri-Gate Wizard, and Firewall Special Summoned Octostretch. That was used for Linkuriboh, and Firewall Special Summoned Aqua Dolphin. He returned Phoenix Blade, using it for Aqua Dolphin’s effect to destroy Junk Forward from Lee’s hand. Linkuriboh and Aqua Dolphin were used for Knightmare Cerberus, and Firewall Special Summoned Junk Forward. Cerberus was used to play another Mermaid in an Extra Link, and Firewall Special Summoned Suprex. He used Suprex and Junk for Phoenix, banished Malicious for a new Malicious, and used that with Binary for Knightmare Unicorn. He Special Summoned his third Malicious, then returned Phoenix Blade. He Set a card, and used Malicious with Unicorn for Topologic Gumblar Dragon! Lee offered the handshake! 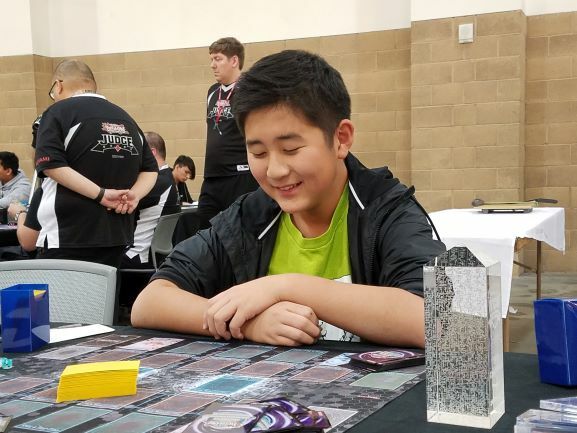 YCS Pasadena: Dragon Duel Champion! 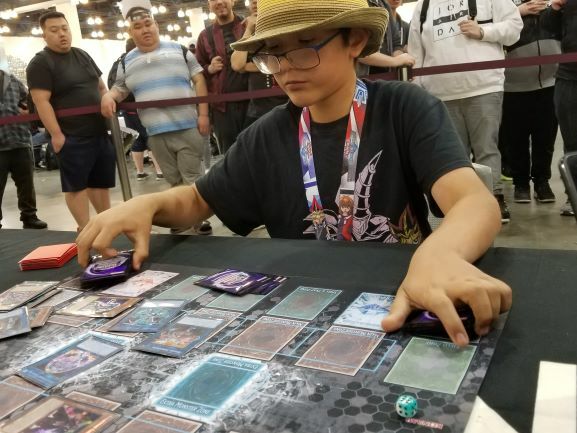 Sunday’s Top 4 Dragon Duelists at YCS Pasadena!